Apple’s New Mouse: Good for Music? So why is this mouse useful to musicians? Because Apple may finally have gotten horizontal scrolling right. Sure, there are Windows mice with horizontal scrolling, but nothing with the 360 degree design of the Apple scroll wheel. I’ve also found that horizontal scrolling seems to be universally broken on the Mac and works only sporadically on Windows (Word — yes; other apps — not necessarily). Apple.com: Force-sensing buttons on either side of Mighty Mouse respond when you press in with your finger and thumb . 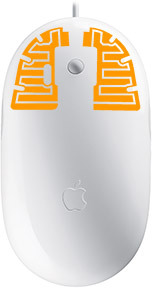 . . the audio feedback built into Mighty Mouse provides an aural sensation that responds to your movements. A tiny speaker inside Mighty Mouse produces button-clicking and Scroll Ball-rolling sound effects. This one deserves a verdict when it ships. In the meantime, I’m sticking with my Logitech.